Among the cells of the immune system involved in the pathogenesis of autoimmune disease, T cells have received the most attention. The central role of these cells in several animal models of autoimmune diseases and in human disease counterparts has provided the rationale for specific therapeutic targeting of T cell subsets, especially CD4 T cells. So far, the applicability of this approach has not been clearly evident in clinical trials, which was also the case when nondepleting “coating” anti-CD4 monoclonal antibodies was used. In the past several years, experimental evidence supporting a major role of B cells in systemic autoimmune disease has grown. 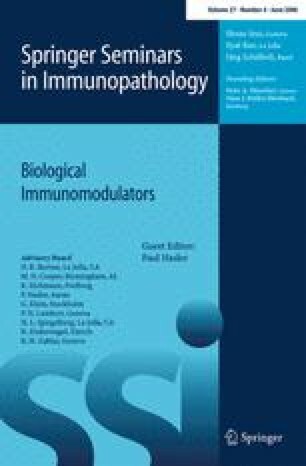 This includes the pathogenicity of certain autoantibodies, the potential of B cells to present antigen in the context of MHC Class II and to signal via costimulatory molecules, and to secrete proinflammatory cytokines. In some instances, engagement of the B cell receptor and other surface receptors is sufficient to stimulate B cells to produce antibodies. The depletion of B cells by targeting the surface marker CD20 has been shown to be effective in treating rheumatoid arthritis with a good side effect profile. Series of cases with other systemic autoimmune diseases indicate that this strategy may be effective in these conditions too. The clinical data add weight to the importance of B cells in the pathogenesis of autoimmune diseases.